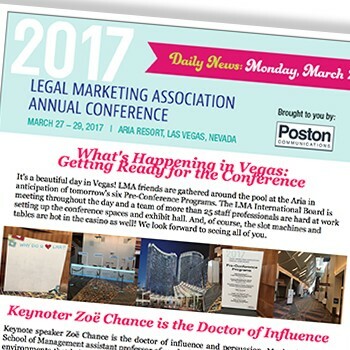 The 2017 Legal Marketing Association Annual Conference, March 27-29, is bringing more than 1,500 attendees to Las Vegas, and Poston Communications is on site to keep everyone connected. Each morning, LMA conference attendees will start their day with an email reporting on the prior, current and next day’s events. Find important tips for each day of the conference, look for pictures of yourself and your friends, hear stories from “off the agenda” events, read session summaries and more with our morning updates. 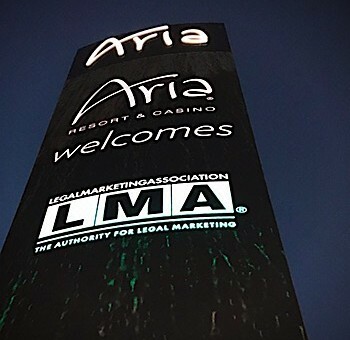 The LMA conference, which marks its 32nd anniversary in 2017, continues to grow each year. Representatives from 47 states and 18 countries are attending three days of sessions, workshops and networking events at the Aria Resort. Essential- and Advanced-Level Sessions – Concurrent sessions provide a range of content options, tailored to be most relevant to your years of experience. Rise of the Legal Marketing Technologist – A new full-day program focuses on the big ideas and big challenges of the next phase of technology-driven legal marketing. General Counsel Panel – We’ll examine how the legal buying cycle is changing and what law firms need to do to respond to clients’ changing demands. 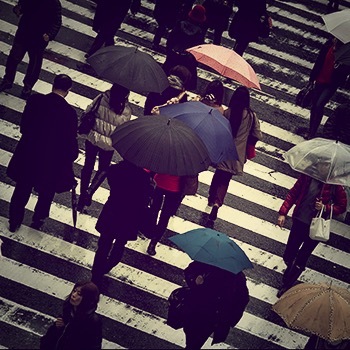 The Business Case for Diversity in Legal Marketing – Our town hall provides a forum to share observations, information, and ideas for developing a greater level of diversity and inclusion in our profession. CMO Roundtables – In-house first-chair participants will have opportunities to collaborate with peers and discuss issues that are most relevant to CMOs. A complete schedule is available at www.legalmarketing.org/ .